RC Schroeder was born in Beloit, Wisconsin where is grew up in the country on a small farm. He worked at his father’s Bakery in Beloit, Wisconsin until he graduated from High School. He took an apprenticeship at Fairbanks Morris Industries becoming a Machinist/Fabricator. All through his apprenticeship, he was working on his unique style of metalworking. From there he moved to Arkansas in 1972 with his family where he continued incorporating nature’s beauty and design into his work. After a couple years they moved back to Illinois to be closer to their families. Later he moved back to Stone County Arkansas around 1977 to begin his long-lived love of creating works of art in various metals. He is self-taught in the technique of chase and repousse’ and produces his own tools in the process. 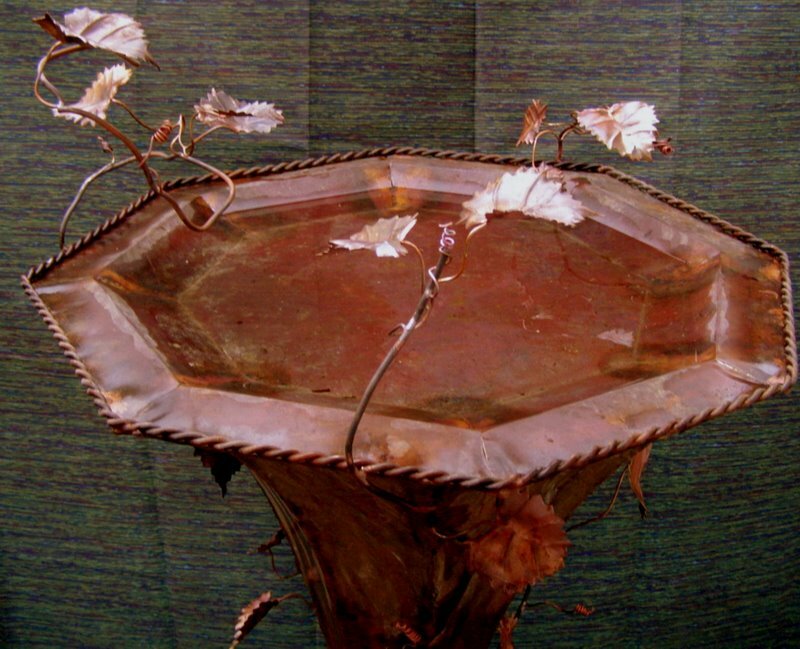 In August 1980, he was juried into the Arkansas Craft Guild under the media of Metals. He was making brass and silver belt buckles, scarf slides, puzzles and sterling silver dogwood jewelry. He’s been noted for his dogwood jewelry ever since. He’s made various types of boxes, birdbaths and ikebanas along with a sculptural mask every now and then. He’s also a specialist in aluminum and stainless steel welding. Caving for the past 41 years he has worked hard in preserving and protecting the wildlife and environments of those caves by constructing fences and gates around and on those caves. He married Jane Wilburn in 1993 and she started polishing his jewelry for him. She was born in Mountain View, Arkansas and raised between there and Dayton, Texas. She was greatly influenced by her grandmothers being involved in several crafts as she grew up next door to them. She’s spent many hours drawing the beauty from the nature around her as she helps RC design some projects. They juried with a second media in 1995 with designer scented candles under the name of Moon River Candles. Some of the fragrances are blended from their own recipes as well as all their rich color choices.